There is more to assessing infrastructure than building condition. The Innova Group’s Functionality and Experience Indices round out the equation and provide objective tools for prioritizing capital investment. The Innova Group works with several organizations that manage large portfolios of healthcare facilities. These systems often find it difficult to prioritize capital investments among multiple facilities and sites—particularly on an objective basis. The Innova Group worked with the Army Medical Department in Virginia and with Kaiser Permanente in California to develop two uniquely useful methods for assessing facilities across a portfolio. 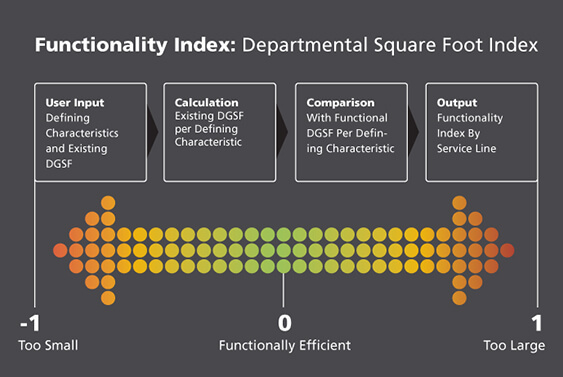 The Functionality Index© evaluates and scores facilities on their functional usefulness and ability to support delivery of healthcare. This augments the commonly used Facility Condition Index by evaluating concepts such as room sizes, walking distances, adequacy of storage, and adjacencies—rather than structural and mechanical systems. The Facility Experience Index©, evaluates and scores facilities on their ability to support a positive patient experience. Areas measured include: Condition & Maintenance, Quality of Environment (aesthetics, lighting); Patient Experience (privacy, positive distractions), and Signage & Wayfinding.